Will You Marry Me Quotes: Wondering how to propose to your boyfriend? Or thinking whether you should wait for him to ask you to get married to him? Well that’s a personal choice, but don’t forget that it’s completely ok to ask him to get married to you. It won’t make him any less of a man nor will it make you any less of a lady. It’s not 1950 for god’s sake! Handwritten notes, romantic messages and cute things to say to lay your heart bare – read on and get inspired to create something of your own to say to mark the most special day of your life! It’s ok if you’re feeling nervous or feeling shy. Keep it real, tell him what you feel and let him know loud and clear that he’s the best thing to have ever happened in your life… and you want it to be that way forever. Oh, and by the way, we’re so happy for you both!! 1) You’re the star that twinkles at night, the breeze that makes things feel right. You’re the sunshine that drives blues away, the beat that makes my heart beat every day. Will you marry me? 2) Every mistake I’ve made in my life has been worth making… simply because they all eventually led to you. I love you baby, marry me, will you? 3) I knew you were the one, when your hugs became the only place in the world I’d rather be. Will you marry me? 4) Kisses, hugs and cuddles will be long, fights, arguments and frowns will be short. That’s pretty much the long and short of my promise to you… will you marry me? 5) I knew you were the one, when a single smile on your face put a thousand in my heart. Marry me, will you? 6) No looking back, no regrets in life… because all that I did eventually led to you. I love you baby will you marry me? 7) There will be smiles, there will be frowns. There will be ups, there will be downs. There will be answers, there will be questions. There will be lots, will be none. Life won’t be perfect, not even for a day. But together on this journey, we will be all the way. Promises I want to make none, except that you, are my only one. Will you marry me? 8) I don’t want to lie, life won’t be rosy all the time. It won’t be perfect. There will be moments when you’ll feel like quitting. There’s be a patch when you’ll question the purpose… but through it all there’s one thing I promise that’ll never happen – doubting who you took this journey with. I don’t just want to be with you, I want to be the only constant through life’s crazy ride. Baby, will you marry me? 9) For me, the word forever has no meaning if it doesn’t include you. Will you marry me? 10) I know we’re meant to be, not because of all the smiles we’ve shared, but because we’ve made it despite the tears we’ve shed. Will you marry me? 11) I love you for who you are, for what you’ve been and for all that you will be… marry me, won’t ya? 12) I’m just an ordinary girl who’s standing in front of you, asking if you want to make her fairy tale complete… will you marry me? 13) I wish words were enough to tell you how I feel like a nervous little girl every time you pick me in your arms. I wish I could explain how even today, being with you gives me inner peace. I wish, there was a way to express, how you not only make me feel complete but also bring out the best in me… baby, will you marry me? 14) I have no shame in admitting that even today, I giggle like an idiot when I think about kissing you. Every time is like the first time and it’ll be like that forever. Will you marry me? 15) You’ve given me all that I didn’t deserve, now I want to spend the rest of my life making sure I give you all that you always have. Will you marry me? 16) What is life? 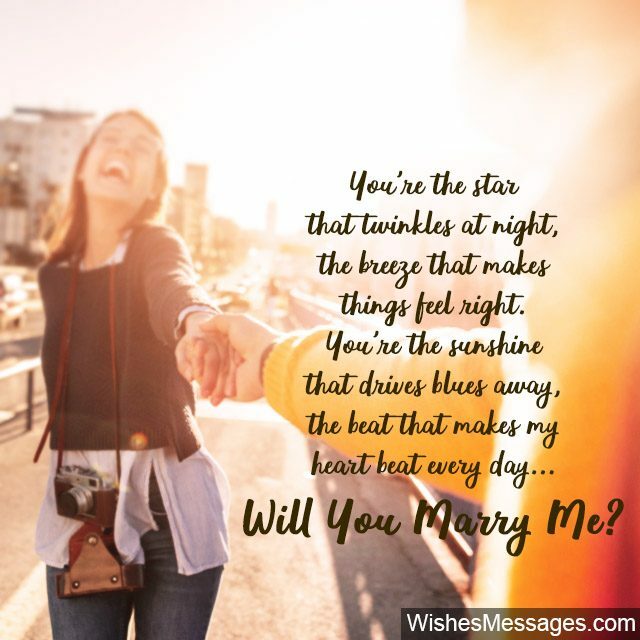 For me, it’s a three-letter word that stars with Y and ends with yoU… will you marry me? 17) Through good and bad, through happy and sad, through ups and downs, through smiles and frowns… I want to spend my life with you, and hope you feel that way too! Will you marry me? 18) The world is a big place but my happiness lies on the tiny corner on your shoulder where I can rest my head feel like the luckiest girl alive… will you marry me? 19) I want to spend every single day of my life reminding you how amazing of a person you are. In return, you can do the same 🙂 Will you marry me baby? 20) For me, Happily Ever After can be summed up in just three letters… YOU! Be mine forever, won’t you? 21) I’m thinking about how we met and how ‘we’ came to be. Can’t help but break into a smile because I truly believe that I’m living a dream. I’m going to thank destiny for bringing us together but before I do that I have one question… will you marry me? 22) I’ll be honest with you. I don’t have my life charted out. I don’t have big plans. I haven’t got everything figured out. And tbh I don’t even want it that way. I want to explore every surprise life has in store, and I want to do it with you… now and forever! Will you marry me? 23) I have only one regret in life… I wish we’d met sooner! Will you marry me? 24) No other need in life comes close to my need to be in your arms. To kiss you, to hug you, to cuddle with you… and no matter how much I get, this lifetime is not going to be enough! I want to spend not just forever with you but more… will you marry me babe? 25) I feel no shame in accepting that I’m addicted to you! 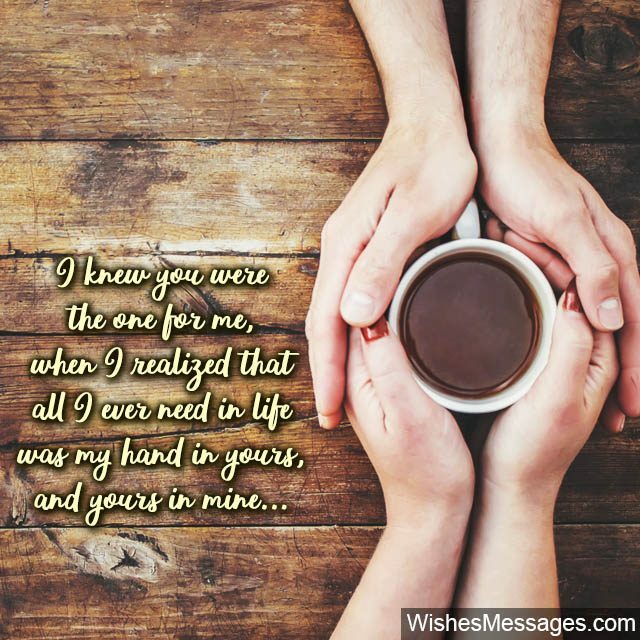 I CAN-NOT and WILL-NOT imagine a single day of my life without you! Marry me, will you? 26) I knew you were the one, when every song became about us. Marry me, will you? 27) The only smile that makes me happy from within is the one that gets plastered on my face when I see you. Will you marry me? 28) All these years I was living a life, but I’ve never really felt alive, until the moment we kissed for the first time. I’ve fallen for you since then I never, ever want to get up. Will you marry me? 29) I’ve gone through heartbreak, I’ve dealt with pain. I’ve been down and out, again and again. Life’s given me, much to think about… but since the day I met you, there’s been no doubt. 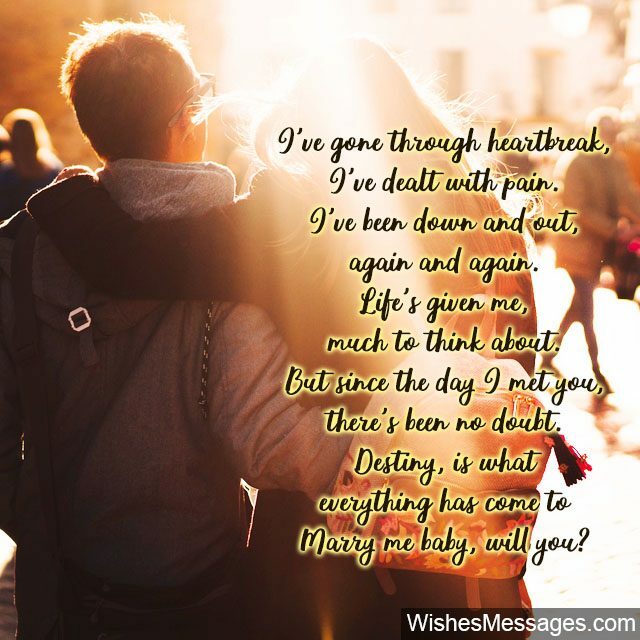 Destiny, is what everything has come to… marry me baby, will you? 30) YOU and ME mean nothing if they’re not used in the context to US. Will you marry me? 31) I’m just a simple girl, saying something that comes from the deepest corner of my soul… I love you, more than I love myself and all I want in life is to be with you till the end of time! Will you marry me? 32) Even today, I don’t want to let go after a hug. Even today, I smile endlessly after a kiss. Even today, I get a shiver down my spine when I think about growing old together. Will you marry me? 33) Whatever happens, wherever we are, we’ll always be together and we’ll always make things work. That’s not just a promise, but a simple truth I’ve based my life on… and I don’t want it any other way. Will you marry me? 34) Because at the end of the day, no matter how rich or poor, how happy or sad… there’s no other way I’d want to spend a single day of my life other than with you. Will you marry me? 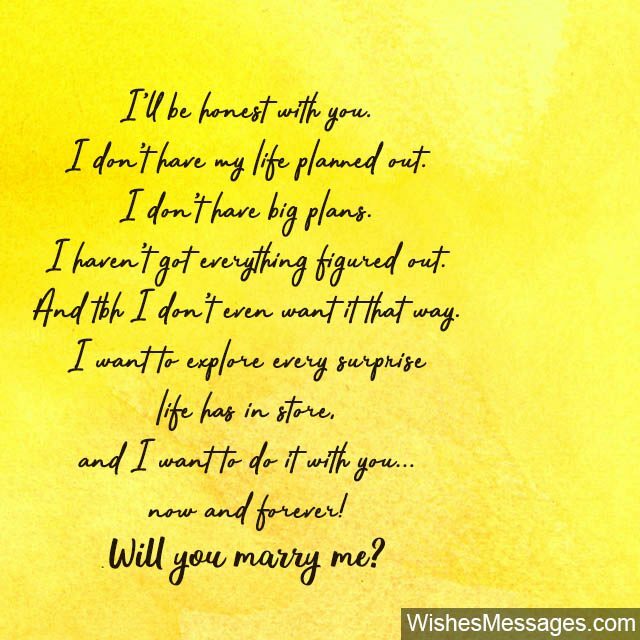 35) Ever since the time we started dating each other I’ve never stopped thinking about ‘what if we were to spend the rest of our lives together?’ Today, I think its time I took the ‘if’ out of the question and give it to you directly… will you spend the rest of your life with me? 36) I knew you were the one for me, when I realized that all I ever need in life was my hand in yours, and yours in mine. Will you marry me baby? 37) I want to make it official and remove one word from our dictionaries… goodbye, because I want you to be mine and me to be yours… forever and ever and ever ever ever. Will you marry me? 38) Life can have a lot of meanings, but for me the only thing that matter are three words… You Me and Forever! Will you marry me? 39) I’m not saying life will be perfect… but I promise that whatever life throws at us, we’ll fight like warriors and celebrate like lovers. 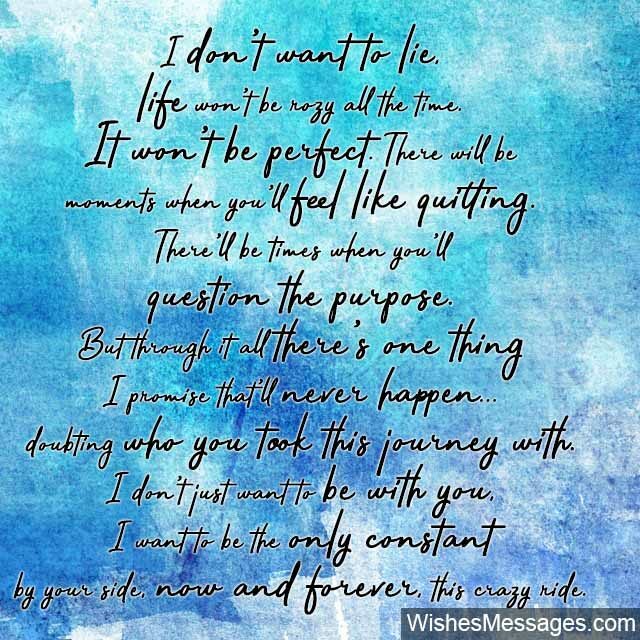 I want to be by your side and you by mine, now and forever! I love you baby, will you marry me? 40) No, ours won’t be a perfect marriage, simply because there doesn’t exist one. Jealousy, arguments, fights… we won’t be immune to these, but I promise we’ll overcome them with trust, patience and most importantly, love! Will you marry me?